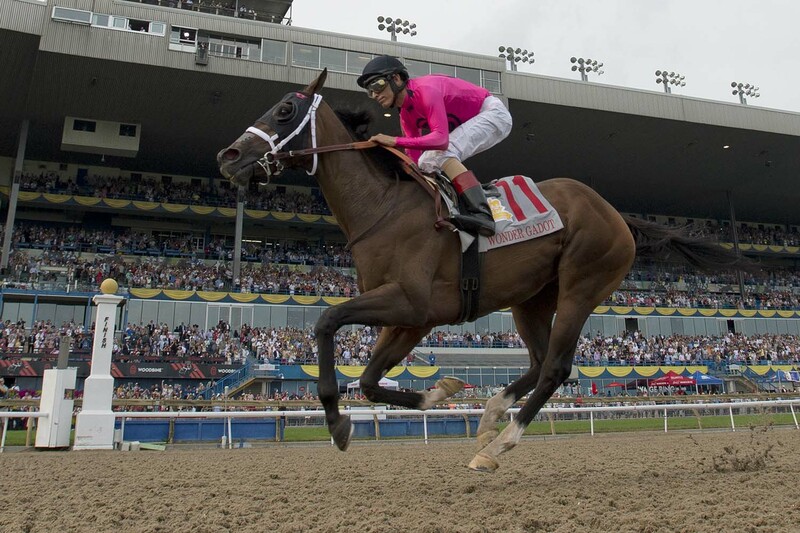 TORONTO, June 30, 2018 – Wonder Gadot, who had done everything but win in her first six starts this season, appeared to benefit greatly from the addition of blinkers as she rolled to a 4 ¾-length victory in Saturday’s 159th edition of the Queen’s Plate. The Queen’s Plate, a 1 ¼-mile race for Canadian-bred 3-year-olds, had attracted a field of 16, the largest since 2011. Wonder Gadot, one of two fillies in the race along with her recent Woodbine Oaks, presented by Budweiser, conqueror Dixie Moon, went postward as the favorite under John Velazquez. Trainer Mark Casse said Wonder Gadot could continue on the OLG Canadian Triple Crown trail with the next stop the $400,000 Prince of Wales, to be contested over 1 3/16 miles on the Fort Erie main track. But first, Casse can be allowed to exult in Wonder Gadot’s Queen’s Plate victory, the second for the trainer and owner Gary Barber in the race after they took the 2014 renewal with the filly Lexie Lou. Telekinesis, the second choice at 3.75-1, didn’t waste much time in moving to the lead under Patrick Husbands and was in front by a half-length through a quarter mile in :23.12 and the half in :46.82. Neepawa and Rose’s Vision were in hot pursuit and the latter had assumed a half-length advantage as the three-quarters went by in 1:11.85. Telekinesis was not done yet, however, as he battled back to regain the leady by a half-length as the mile went by in 1:36.20. But by this point Wonder Gadot had moved into serious contention on the outside, Cooler Mike was battling toward the inside, and Aheadbyacentury had come from well back to loom a serious threat. Telekinesis finally gave up the lead and would falter to fifth as his stablemate Wonder Gadot had cruised into an insurmountable lead. Aheadbyacentury continued on resolutely to end the runner-up. “I had a great trip,” said jockey Luis Contreras. “My horse broke okay and I saved a bit of ground. At the half mile I was ready to make my move and the horse in front of me started to drop back and bothered me a little. I moved outside and let him rebreak and he was fine. Cooler Mike, contentious throughout, finished 2 ¾ lengths back in third in a game effort for trainer and co-owner Nick Nosowenko. “I’m out of breath,” said jockey Jesse Campbell. “I’ve never been so happy to run third in my life. He ran huge. Well prepared and Nick did a great job getting him ready for today. He ran the race of his life. Strike Me Down, one of two Sam-Son runners in the race, also rallied from off the pace to miss the show money by just a head. Rounding out the field were Say the Word, Boyhood Dream, Alternative Route, Real Dude, Neepawa, Inge, Silent Poet, Pawnbroker, Rose’s Vision and Dixie Moon, the Woodbine Oaks winner and third choice in the Queen’s Plate at 5-1. The Queen’s Plate is the first leg of the OLG Canadian Triple Crown for Canadian-bred 3-year-olds, which continues with the July 24 Prince of Wales Stakes over 1 3/16 miles of dirt at Fort Erie and wraps up with the August 18 Breeders’ Stakes at 1 ½ miles on the E.P. Taylor Turf Course. Wonder Gadot, bred in Ontario by Anderson Farms Ontario Inc., became the ninth filly to win the Queen’s Plate since its first running at Woodbine in 1956. She was following directly in the footsteps of Holy Helena, who won last year’s edition. She returned $6.40, $3.80 and $3.20. Aheadbyacentury ($17.60, $10.30), sent off at 28-1, completed an 11-15 exactor worth $157. The 11-15-2 trifecta with 46-1 Cooler Mike ($15.90) returned $3,038.90 and the $1 superfecta with Strike Me Down completed an 11-15-2-4 worth $9,130 for $1. This entry was posted in Woodbine News and tagged 2018 Queen's Plate, Horse Racing, Mark Casse, Queen's Plate, Queen's Plate Festival, Wonder Gadot, Woodbine. Bookmark the permalink.